The current Medicare program is so popular, attempts to change it have been described as the "third rail" of politics — in other words, it’s so contentious and charged that it’s a politically untouchable issue. Likewise, expanding to Medicare for All was once thought to be a lethal election-year issue. Not so much anymore. So what has changed? Bernie Sanders. During Sanders' presidential run two years ago, he stopped in Madison and criticized Gov. Scott Walker for not allowing more people to enroll in BadgerCare — the state's Medicaid program. Like state Democrats, Sanders would like to see the program currently reserved for the country's lowest-income residents available to anyone. At the 2016 rally, Sanders insisted health care is a "right of all people" and he urged that both Medicaid and Medicare be expanded. "That is why we have got to join every other industrialized nation by passing a Medicare for All, single payer program," Sanders proclaimed to a cheering crowd in Madison. Two years later, it’s still a polarizing issue, sparking cries of socialized medicine among the Republican Party. The very same night she won the Wisconsin GOP primary, U.S. Senate candidate Leah Vukmir wasted no time in criticizing incumbent Tammy Baldwin on the issue. "She campaigns for single-payer, government-run health care. She’s not afraid to stand with the avowed socialist Bernie Sanders," Vukmir told an animated group of election-night supporters in August. Medicare coverage is an issue that splits along party lines. And for years, Republicans have tried to make the program smaller, not bigger. President Donald Trump claims expanding Medicare would hurt those who currently rely on the program. An opinion column the president wrote in early October prompted a flurry of fact-checking by NPR and other media organizations which took issue with Trump’s characterization of the plan's cost and the availability of medical services. A national poll conducted by the Kaiser Family Foundation showed that overall, a majority of Americans support a national, "single payer," government-run program. That support increases when talking about Medicare as a public option where people could choose whether to buy it or stick with their private insurance. Democratic U.S. Sen. Baldwin supports both. 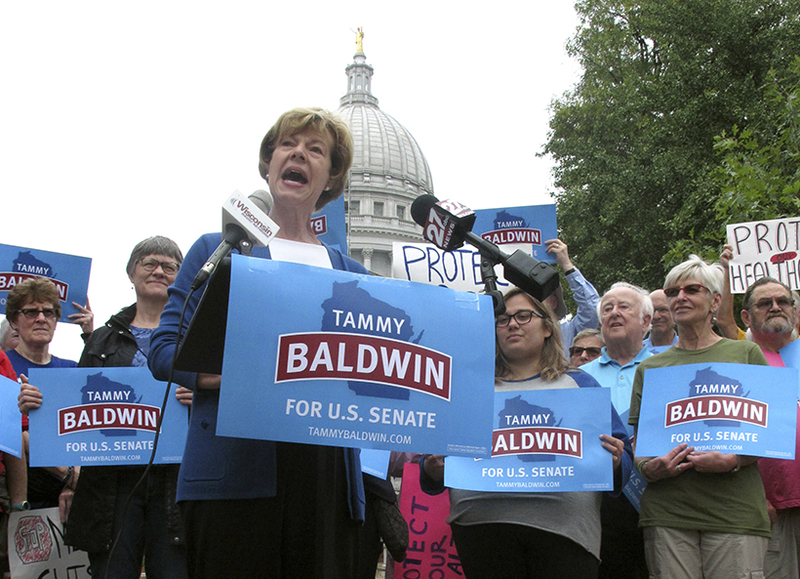 "These are all ideas worthy of debate right now," Baldwin said at a press conference in Madison in September. "Because while we narrowly defeated the effort to repeal the Affordable Care Act, our work is not done and we have to address costs." There are a lot of proposals out there for what Medicare for All would look like, and it often means different things to different people. Baldwin has introduced legislation allowing people ages 55 to 64 to buy into Medicare and joined a group of Democratic senators to make Medicare available to everyone as a public option on the ACA exchange.She is also a co-sponsor of Sander’s Medicare For All bill. The Kaiser Family Foundation even created a side-by-side comparison of all the Medicare for All proposals to keep them straight. Baldwin said Medicare for All would reduce administrative cost for businesses and simplify a complicated system for families. "It gets hard to figure it all out. Sometimes, you just wish it would just be 'Hey, we can just go to the doctor and get it taken care of,'" said 55-year-old Bob Morrison of West Bend, who has had to battle insurers after getting a medical bill he didn't expect. Morrison said his wife had thyroid cancer along with hip and knee replacements, which resulted in bills their insurer sometimes resisted paying. The self-described independent who voted for Presidents Barack Obama and Trump, along with Walker, sees flaws in the current health care system, but isn’t necessarily ready for a big change. "And I’m not so far against the 'quote' single payer system. We pay taxes for Social Security ... the only problem I have is the government in charge of all that money," Morrison explained. "That’s scary." Polls show support for single-payer health plans drops off when people are asked about the potential cost of a national, government-run health program. There's also the logistics of transforming an entire system that currently relies heavily on private insurance in which people get coverage through their employer. While an overhaul may be a heavy lift politically, some continue to hold out hope. "The only solution is to have a sort of baseline coverage that everyone is eligible for in country," said Lisa Marie Ludwig, a social worker from the Town of Winchester in Vilas County. "I know politically we have a long way to go for that and it might not happen in my lifetime — I don't know, I’d like to be more hopeful than that." History suggests that it could be a long shot — there have been efforts to create a nationalized health care system dating back to 1945. If there's a difference now when it comes to Medicare for All, it's that more Democrats are willing to talk about it. This story is part of a three-part election season series on where Wisconsin's candidates stand on health care. Some of the interviews in this story came from WPR's special series Beyond The Ballot, a project dedicated to finding out what Wisconsinites care about. Read Part 1 and Part 2 of the series.